Our qualified technician will come to you with no call out fee. Fridge0 Refrigeration operates throughout Melbourne's Eastern and South Eastern suburbs. We offer same day service and repairs on all makes of Bosch refrigerators and freezers. bottom mount, side by side and French door versions. The most common issues are the Side by Side refrigerators usually with the water and ice dispensers. There are also two versions of the side by side refrigerator. The earlier model is a single cooling design where all the cooling is performed in the freezer compartment and fan forced into the refrigerator compartment. With these models the main problem is the evaporator fan located up top inside the freezer compartment. The symptom is that the refrigerator stops cooling correctly, or at all, followed by the freezer compartment function being OK on the bottom section of the compartment but defrosting up the top section. The most common cause of this symptom is a faulty freezer fan. Once the fan is replaced and the evaporator coil is cleaned with the ducts unblocked with ice normal operation should recommence. built into them. With these models the most common issue is the main board or PCB failing. refrigerator needs to be defrosted either by time or by water which is more involved. or the refrigerator starts to fail in keeping the temperature at the correct setting. 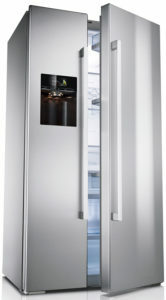 The upright recent Bosch model refrigerators are well designed and generally don’t have too many issues.